If you haven’t noticed by all of the photos popping up on your Facebook newsfeed, wedding season is upon us! We all know at least one bride, bride-to-be, or you may be a bride yourself. Brides are so busy planning the details of the venue, the flowers, the dinner, the cake and the DRESS, that they sometimes forget to give their skin the time-line and attention it needs to get in shape for their wedding day. After all, what good are the flowers, delicious cake and gorgeous dresses if your skin isn’t in top shape for the big day? Whether you’re a year away from walking down the aisle or just one week, here are a few tips to help get your skin glowing, healthy and beautiful. Planning a wedding takes time, right? Remember to add a skincare routine into your planning, and you’ll be right on track for glowing skin on your wedding day. It’s a good idea to get professional advice, so see your Image Skin Specialist ASAP!!! Don’t leave it to the last 6 months before your wedding day. This may not give you enough time to see optimum results particularly if you have a skin problem or concern. It’s also important not to plan any waxing or peels on the week of your wedding in case your skin becomes red, inflamed or dry. IMAGE Facials can be performed two weeks prior to your wedding day so at home on the week of your wedding gently increase your skins hydration with our wedding favorite, IMAGE’s IMASK Biomolecular Sheet Mask. Now you are ready! No matter what your skincare routine, it's important for all skin types to exfoliate, exfoliate, exfoliate! When you remove dead skin, blackheads, and impurities from your face and body, your skin will be left glowing for those wedding pictures. Try to exfoliate once a week to get best results. 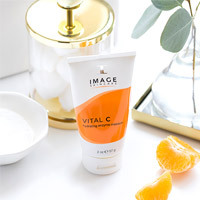 Brides adore IMAGES's Vital C Hydrating Enzyme Masque, gentle yet gives a radiant youthful looking skin. Stress can have a negative effect on the health of your skin, so make sure you take a few minutes each day to breathe. It's easy to get overwhelmed while planning a wedding – So many decisions to be made and last-minute problems to be solved. It's the perfect recipe for stress! Try taking a yoga class once a week, or zoning out in the car while driving home from work instead of talking to your wedding planner, or in some cases, your want-to-be wedding planner, mom... Take some time for you, and trust me, your skin will be thanking you! When it comes to hair and makeup, make sure you plan a trial run to test your hair and makeup styles. The last thing you want on your big day is to be finished getting ready and not like the way your hair is parted, or how much eye makeup your makeup artist put on. By doing a trial run, you get to talk though your ideas and looks with your stylist and makeup artist ahead of time, and make sure you get the perfect look for your day. Oh, and another little tip – waterproof mascara. Even if you swear you are the last person in the world to cry about anything... your wedding day can change all that. Be prepared. The night before your wedding, skip the alcoholic beverages, and opt for water with lemon. Go to bed early, and get your beauty sleep! Sleep is so important for glowing, healthy skin. What a better way to start your big day than being well-rested and ready to make your grand entrance! shinier lips that can be blended with your special wedding lippy, safety pins, breath mints and a bottle of water. There you have it! Plan ahead, get a routine, exfoliate, don't stress, get some beauty sleep, do a trial run and don't forget that emergency kit! Most importantly, don't forget your beautiful smile, and remember... No matter what happens on your big day, you are starting the journey of a lifetime with your best friend. Relax, let things go, and soak up those little moments.